Over at Edutalk we have started posting a series of segments from The Purpos/ed Summit for Instigators. 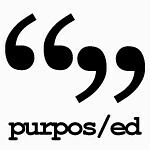 Purpos/ed is the first event from Purpos/ed: a non-partisan platform for discussion and debate about the purpose(s) of education. Started by Doug Belshaw and Andy Stewart prpos/ed has published a stream of material, discussions, and other media at a rate that leave me breathless. Just because Edutalk has gained some purpos/ed, should not put off our regular and irregular contributors. Everyone with something to say about education is alway welcome. Feel free to add to the mix in any of several ways. Hopefully the mention: EDUtalk ~ Stephen’s Web will increase both Edutalk’s audience and contributors. In amongst this weeks purpos/ed audio came a posted sent in by @oliverquinlan Why Stories? Keynote at the University of Plymouth #onandup conference via email. This was a link to a soundcloud page, the first one we have had. I followed the link and added the embed code to the post as I moderated it. SoundCloud looks really interesting and seems to be expanding rapidly. I am not sure yet if we can use the SoundCloud in the same way as we currently use AudioBoo and iPadio but will be having a look. If you know of any other services we could lever into Edutalk, please let us know.